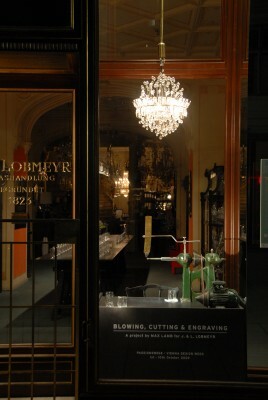 Mouth blown, cut and engraved cyrstal. 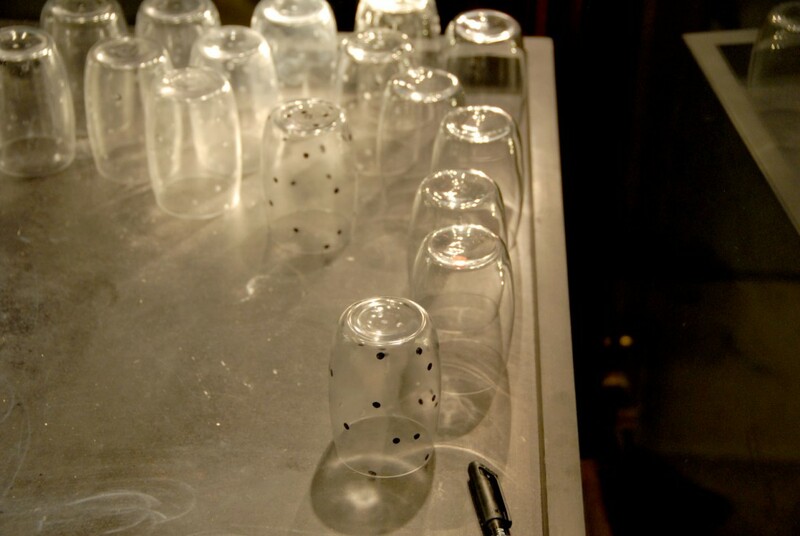 Blowing A collection of small vases that adopt Lobmeyr’s iconic Alpha glass from 1952 but whose production has been frozen during the process of blowing. The project illustrates both the consistency of the mould blown glass and the irregular beauty of the mouth-blowing process. The Alpha glass, as with all Lobmeyr crystal, is mouth-blown into an opentopped wooden mould whilst being rotated in the hands of the glass-blower, whose sensitivity towards the feel of the glass inside the mould can only be learnt through experience. For example if the glass feels too thick the blow-pipe can be gently lifted to stretch the glass thus reducing the wall thickness. Once the volume of the mould has been filled the glass often continues to inflate outside of the mould creating an irregular bubble on top of the glass until the temperature reduces and blowing stops. The bubble is cut from the glass and discarded for recycling. 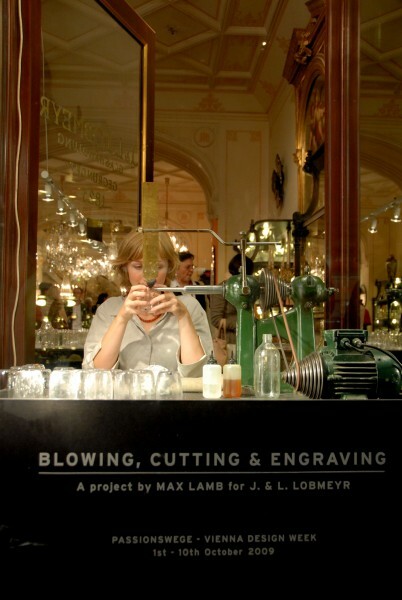 Lobmeyr’s strict quality-control process ensures that a glass with any significant differences or imperfections is dismissed and returned to the glass-blowing factory. Quality of material and craftsmanship is exponentially higher in Lobmeyr crystal than production or machine-blown glass, but repetition and consistency attempts to be equal. 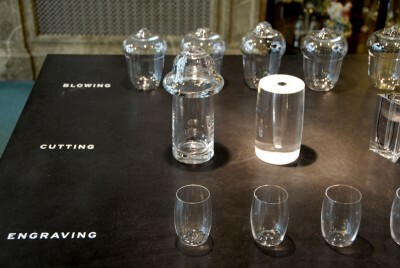 This presentation of mouth-blown crystal vases opposes the desire for repetition and by removing all stages of glass production following the actual blowing process also removes consistency. 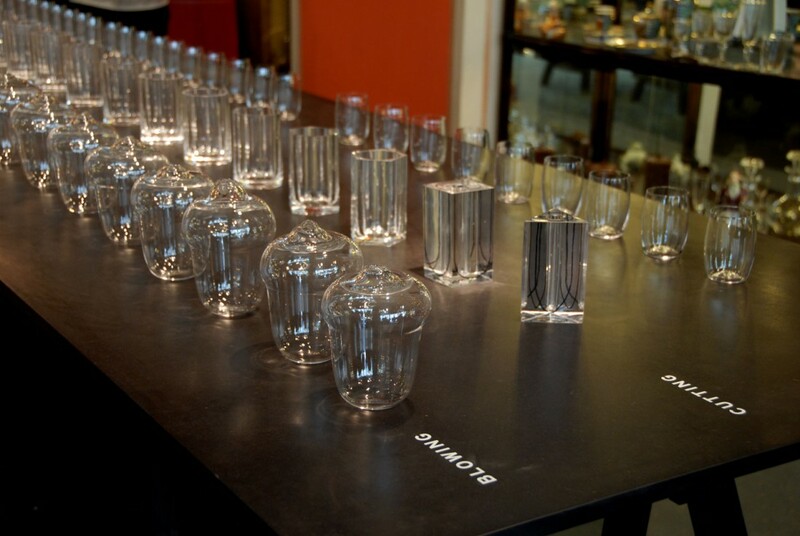 Each ‘capped’ Alpha vase thus becomes totally unique and in doing so celebrates the hand-made quality of Lobmeyr crystal. Cutting A series of 23 cylindrical glasses cut with an increasing number of facets, from 3 to 34, exploring the idea that cutting creates flat surfaces by removing glass on an abrasive wheel. The project uses the cutting process as a tool for engineering simple, mathematical geometry rather than cutting facets simply for decorative purposes. The outside diameter of each glass is identical but the wall thickness of the crystal reduces as the number of facets increases. The required thickness is dictated by the cutting process itself and must be communicated first to the glass-blower. From the basic cylinder three vertical cuts will generate a triangular glass column, four cuts a square column, five cuts a pentagon, six cuts a hexagon, ten cuts a decagon and so on. 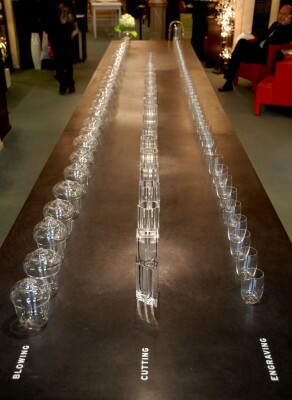 The rotating tool used to mark each glass prior to cutting can divide glasses into as few as 3 sections and as many as 34 sections – from a Triangle to a Tetracontagon. Certain divisions, such as 7, 11 and 13 sides are not available on the dividing machine. 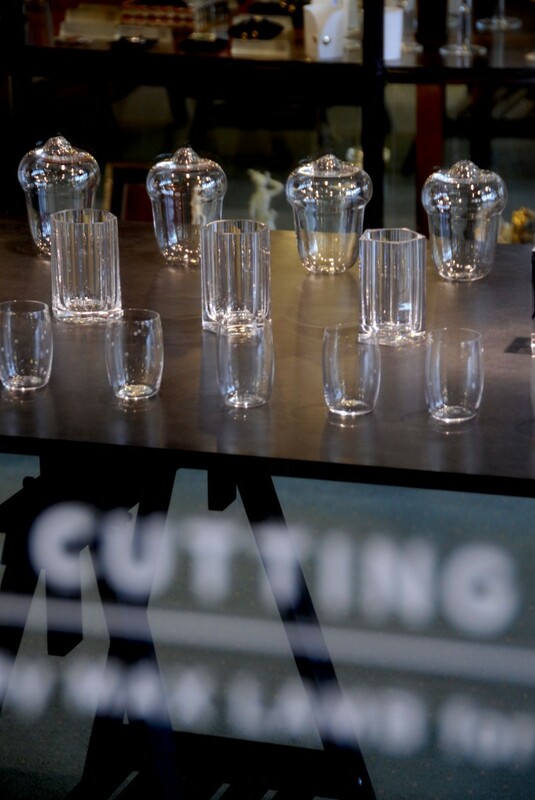 The cutting project explores the optical effect of faceted crystal in comparison to the intrinsic value of each glass (related to time, difficulty and failure-rate). Is there an optimumnumber of facets that achieves a perfect balance between visual effect and cost? Engraving Engraving is the slow, delicate and highly skilled process of cutting into the surface of the crystal in a very controlled way creating pattern, image and even text. An engraved letter requires an average of one hours work. Pieces demanding over 1000 hours of engraving are no exception. 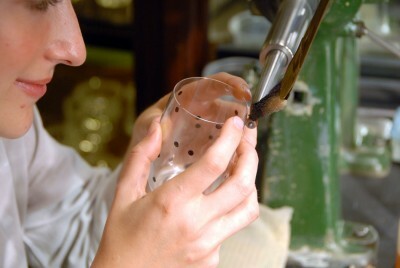 The more elaborate and time-honored the engraving the more expensive the finished glass. 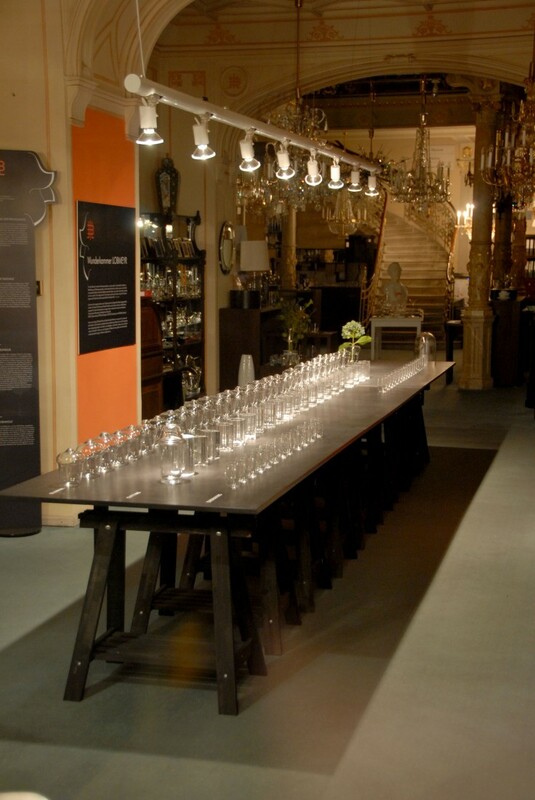 To represent the value of the engraving process I am presenting a series of crystal glasses that systematically increase in price in relation to the amount of engraving applied. I selected Lobmeyr’s popular Achtel glass to manifest this idea. 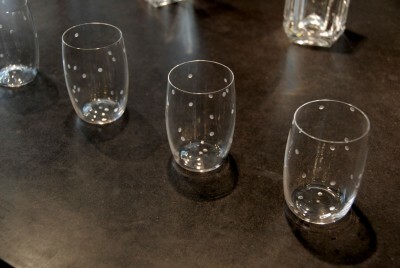 The simple spherical ‘kugel’ shape is engraved onto each glass using a stone wheel. The first glass has a single engraved kugel, the second glass two and the third glass three kugels, each positioned at random by the engraver. The engraving process continues until the final glass, number 641, has 641 kugels randomly engraved over the entire surface of the glass and there is no further space for more kugels. As each glass becomes more highly populated with kugels and the pattern more decorative the cost also increases, thus demonstrating the added value generated by the labour-intensive and highly skilled engraving process. The pricing structure of each glass is transparent and a direct representation of the cost of engraving, which ultimately comes down to time. 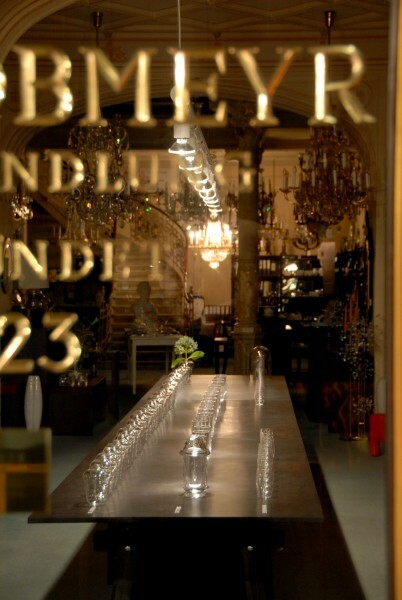 Both functional and material value of each glass is identical but the intrinsic value varies according to the engraving. My presentation of engraved glasses is a communication tool to reveal the skill-level and value of traditional crystal engraving.